James Conway and Jean Sabot!!! Jean Sabot is in town from Brittany visiting our buddy James Conway and before they head off to teach and perform at SPAH, they gave B1 a sneak preview of their show! Conway is, in our humble opinion, one of the finest musicians out there and when it comes to playing Irish music, he's our longtime favorite! He connected recently with Jean Sabot who is a fantastic chromatic player and has the Irish stuff down cold too. They sound terrific together, screaming through lightning-fast jigs and reels in unison, sometimes even in harmony! Both talked about their technique and alternate tuning approaches and James even had a tongue-switching lesson for us to get that technique happening in our blues playing. It was a great night of traditional Irish tunes in B1 - thanks James and Jean for stopping by and sharing! Attending SPAH this week? Don't forget to stop by the Tuning Table booth and say hi to our own Highway RickEy! Pat Missin, Joe Filisko and David Barrett all think the Tuning Table is a must, so go get one! 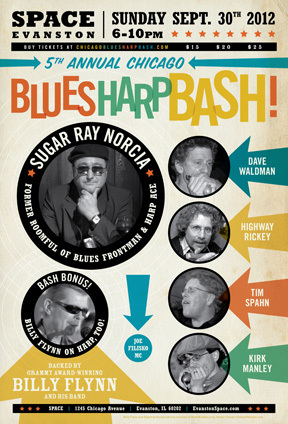 Blues Blast Magazine has a terrific interview with our Chicago Blues Harp Bash headliner, Sugar Ray Norcia. Read it here! Chicago Blues Harp Bash #5!!! Get your tickets now before they sell out - the reserved table seats are hot items and half gone! It's going to be a great show! Getting some posters from Joe and getting them up in appropriate places - music stores, shops near SPACE, etc. Three cheers to Mrs. Corporate for another terrific poster design! Thanks Marianna! Old Town takes a break - classes resume September 10th. Relax, re-register and we'll see you in September! The newsletter will take a break during this time too. If special news comes our way, we may do a special announcement here or on our Facebook page. Speaking of registering, our own Zoe Savage is expanding her teaching offerings at Old Town with a Cajun harmonica class as well as a Level 1 Blues Harp class. Sign up! Joe was caught on video in Brighton, England recently sitting in with Goofer Dust and blowing that Thunderbird!